A video compilation of mishaps and dumb accidents that appeared in January. A few of the crashes are just dumb luck, nobody’s fault really. But that’s the tiny minority. 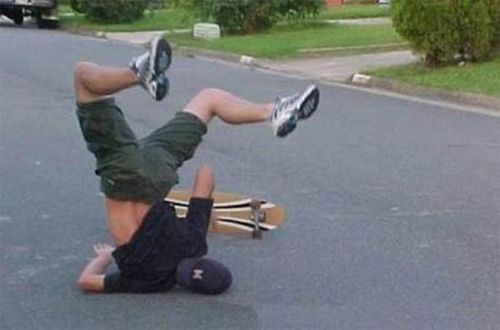 Skateboard disasters are a staple of fail video compilations. Will these people never learn? It’s amazing how many people do the same thing month after month, doing face plants while trying and failing to do bicycle, ski, skateboard and burnout tricks. Do people never learn? They’ve surely seen the videos of people doing the exact same thing they’re doing, with disasterous results? How do they think they’re experience will turn out better? This entry was posted on January 31, 2011 at 9:47 pm and is filed under Uncategorized. You can follow any responses to this entry through the RSS 2.0 feed. You can leave a response, or trackback from your own site.